Rabbi Chaim Azimov and a Jewish resident of North Cyprus tackle an ancient text. Yards from one of the biggest hotel complexes on the island of Cyprus' northern coast, a Jewish family is building a faithful following. Chabad-Lubavitch Rabbi Chaim and Devora Azimov moved to Kyrenia in March 2008 to open North Cyprus' first center dedicated to Judaism. Today they assist more than 100 Jews who have moved to the area in recent years. Housed in a spacious villa close to the sea, the center consists of prayer and meeting rooms, as well as living accommodations for the Azimovs and their two children. "We are here to [strengthen] Jewish pride and Jewish life," says Chaim Azimov. "It's our job to be here for everyone." Having made their home in a secular and predominantly Muslim state, the Azimovs stay away from politics, remaining focused on their beliefs and day-to-day roles in the lives of their community members. "We are not here to get involved in politics," says the rabbi. "Everyone is welcome. Our gates are always open. People here are very understanding." A year-and-a-half after arriving on the island, the family has not faced discrimination in any form. "I have never experienced any antipathy," adds Azimov. "We respect everyone whatever their religion, and I think people here do too. We try not to step on anyone's toes and try and make everyone feel comfortable." North Cyprus’ transplanted Jews are often surprised to learn there are others like themselves. Although the area has a long Jewish history, there are no indigenous Jews in North Cyprus at present. The number of Jewish residents, however, is growing slowly; many new arrivals from the United Kingdom, United States, Israel and Turkey are surprised that a community already exists. "There are many people from the U.K,. for instance, living here and they think they are the only Jews," relates the Israeli-born Azimov. "Then they find another and another, and it grows like a jig-saw" puzzle. Simon Harding, 46, chairman of the Cyprus Pumas rugby club and co-owner of a bistro in Alsancak, has been a member of the center for more than a year, after being contacted by Azimov shortly after it opened. "When the rabbi first contacted me, I was quite surprised he was here," says Harding. "He simply said, 'Come on down,' and it was exciting to get involved. "I think it's important in two ways: It gives people from the same background and same heritage the chance to meet and do the same things," he continues. Devora Azimov "is a great cook. We eat great food together. We eat chicken soup like my grandmother used to make." Cyprus has long played an important role in Jewish history. Jews lived on the island before and during Roman rule, with Cypriot Jews reported to have taken part in the great rebellion against Trajan's Rome in 117 C.E. Ancient synagogues are known to have existed in Lapta and Salamis, and by the late Middle Ages, Jewish communities had developed in Lefkoşa, Paphos and Gazi Mağusa. In the later part of the 19th century, several attempts were made to settle Russian and Romanian Jewish refugees in Cyprus. Fifteen Russian families under the leadership of Walter Cohen founded a colony in 1897 at Margo, south of Ercan. The abandoned village is now within a Turkish military zone, but a synagogue and Jewish cemetery remain. During the Second World War, the island served as a haven for hundreds of Jews fleeing Europe. Following the liberation of the concentration camps on the continent, British forces set up a refugee camp in Pile, north of the present-day Dhekelia Sovereign Base Area, for Holocaust survivors and others attempting to enter the Holy Land. Today in Kyrenia, Chabad-Lubavitch of North Cyprus hosts a Jewish preschool and weekly Shabbat services. 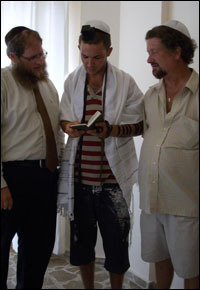 The Azimovs also offer one-one-one study sessions, visit hospitals and prisons, lead adult education classes, and ensure a reliable supply of kosher food to the community and Jewish tourists. "We are one big family," says the rabbi. During last week's High Holiday services, the location was bursting from the seams. "Rosh Hashanah was moving," details Devorah Azimov. "A woman living here for 24 years, who had no connection to Jewish life, came to High Holiday services for the first time." Dan Webber writes for Cyprus Today, where a version of this article was originally published.